Written from the point of view of someone achieving business success in today’s turbulent economy, Forget Strategy. 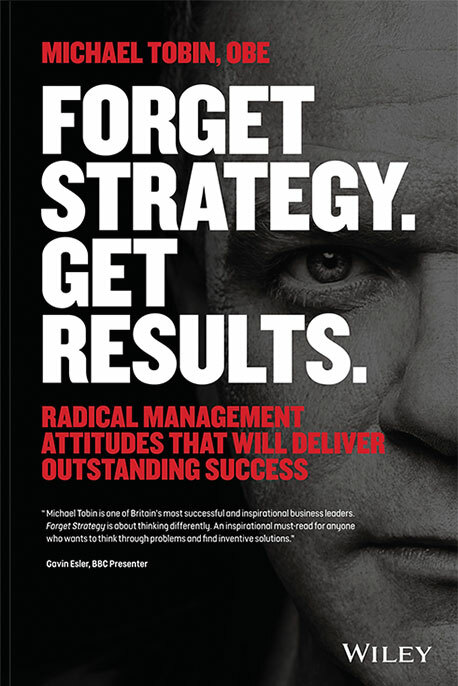 Get Results offers you a fresh way of thinking about successfully managing any sort of business, under any conditions. Controversial, thought-provoking, and entertaining, it delivers TelecityGroup founder and CEO, Michael Tobin OBE’s unconventional approach to management and shares the lessons he’s learned on his path to building one of the world’s largest data center provider companies. I wanted to create an experience that would help the team convert their fearfulness into fearlessness, something that would instil fear in them but then show them that their fear was unfounded. We had, as we still do, a regular management meeting away from the office. On this occasion I booked us into a hotel in Edinburgh: we had a strategy meeting, talked about the future, and the likely merger, and visited a local whisky museum. Then one afternoon I took them out towards the Forth Bridge, where the minibus turned into the Deep Sea World car park. Everyone was relaxed, if somewhat puzzled. The first inkling they had of what I had in mind was when each of them were asked for their wetsuit sizes. I wasn’t letting them in on anything. With the suits on, we all had breathing apparatus training. Already there was apprehension in the ranks.